For our next review we decided to try an ancient culture themed game. The game loads and we are immediately welcomed by an awesome animated intro. We won’t tell you more than that so you can be just as pleasantly impressed as we were. Next, we are given the choice between Casual Mode and Expert Mode. Casual Mode allows you to make matches leisurely while Expert Mode turns the game into a fast, action packedMatch 3 challenge. We decide to go with Casual mode this time so that we have more time to look around and take in all the fine details. 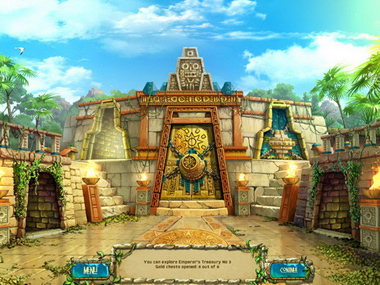 Seconds later, we find ourselves inside of Montezuma’s palace surrounded by 5 locked doors, which protect the priceless riches of the ancient Emperors. One of the doors opens and we receive a message that we must enter the treasury and match tokens to unlock precious treasure chests. To break open a lock, we must score a certain number of points by making matches and collecting gems in 1 minute. The goal of each level is to earn a gold medal. To achieve this we must score enough points. Once we collect enough gold medals, one of the chests will open and we will be awarded a Magic Star. We start making matches and collecting gems, which activate the points’ multiplier. 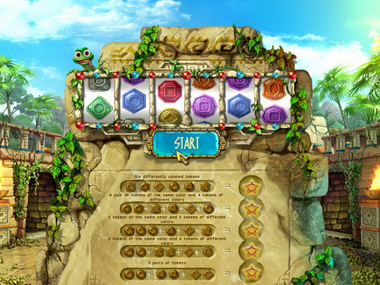 The more gems you have inThe Treasures of Montezuma 3, the most points you earn. Things are going well. We’re passing levels and have some Magic Stars, which can be spent on bonuses and power ups in the Shop. This is a great feature because it means you never have to wait for a recharge during game play. The coolest thing about the Magic Stars is that you can reassign them during the game to match your strategy or Match 3 style of play as you go along. We decide to buy a Totem with unique powers that can help with my game strategy. 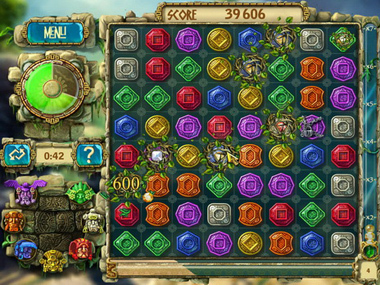 Totems have to be activated though by making consecutive matches of identically colored tokens. Ours, for example, unleashed a fireball that destroyed a bunch of tokens after we made consecutive matches of red tokens. To make a long story short, we still haven’t finished the game but we have gotten through half of the 160 levels and puzzle challenges. We are loving the visual and audio effects and just recently activated the Score Frenzy Mode! 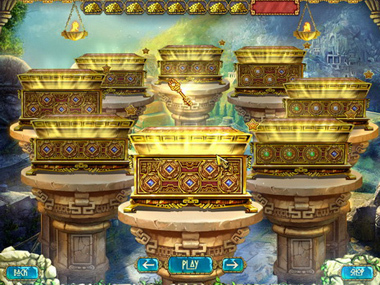 We matched enough tokens to fill a vessel at the bottom of the screen with sand. All points during Score Frenzy Mode are doubled – WOOHOO! GRACIAS POR TODOS LOS MENJASES QUE ME DAIS.PARECE QUE SABEIS MI ESTILO DE JUEGO. AHORA ..MONTEZUMA 3 WOW !! CHAO ! gracias por los mensajes que me dais,ahora espero ver montezuma 3.GRACIAS DE NUEVO.! Please delete my email address from your files as I no longer wish to participate in your games. Please remove me from the email list. I love this game, I am totally addicted. Have played it to the end 3 times now. I just started playing this game today andd I only can play it for about 5 mintues before it shuts down the game. I have other games that I play and that play fine, this is the only one that dose it.